I’ve updated and finalised our 2007 Year Book in our online Photo Album. Highlights of the year were our visit to The Gambia in January, where we saw 177 different species of birds, our holiday in the south of Spain, where we explored Andalusia and a part of Portugal, and our diving trip to Sharm-el-Sheikh in Egypt, where we had some wonderful dives in the Red Sea. Today we visited Teylers Museum in Haarlem to see one of the rarest and most expensive books in the world: “The Birds of America” by John James Audubon (1785 – 1851). 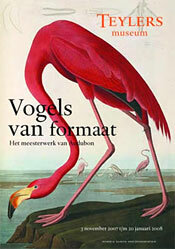 The exhibit “Vogels van Formaat” (that runs from 3 November 2007 to 20 January 2008) has on display an original copy of the huge book. It consists of five volumes depicting all birds of North America (as known at the time) in actual size on beautiful dramatic paintings by Audubon. Approximately 200 sets were thought to have been created in the early 1800’s, but only about 130 are still known to exist. One of these was sold by Christie’s in New York in 2002 for 8.8 million dollars! Teyler Museum bought the first edition book when it came out for 2243 guilders and has owned it since. Throughout the time the book is on display, the museum opens a different page in each book every day.